Camila Fuchs is Camila de Laborde and Daniel Hermann-Collini whom forged in London’s global melting pot. Originally they hail from Mexico City and Munich respectively. 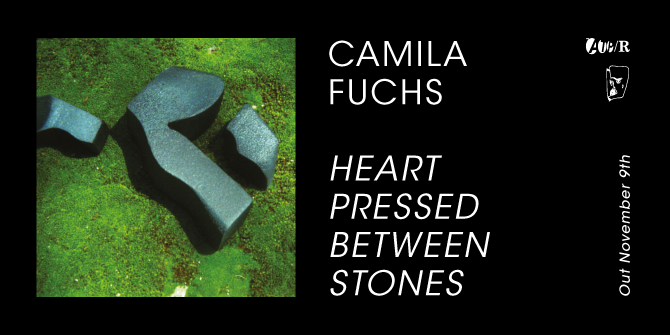 Heart Pressed Between Stones is Camila Fuchs’ second album after 2016’s Singing From Fixed Rung. 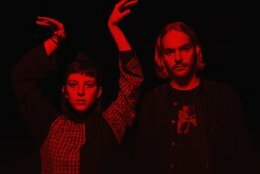 In the short time between each they’ve supported they’ve supported / shared a stage with Actress, Aleksi Perala, Laurel Halo, Starcrawler, William Basinski, Braids, Ben Vince, Charles Hayward and played for the second time at Mutek in Mexico live. The DNA of Nordic avant-pop songstresses Guðmundsdóttir and Dreijer Anderson are still traceable but appear this time more as blueprints on which Camila Fuchs map out their identity. The seamless melding of artificial and organic sound sources together with de Laborde’s untreated stripped vocals lends their songs an almost archaic ageless quality where the sonic bedrock affirms the lyrical subject matter. The moment album opener One on One’s chords unfurl it’s apparent you’re in store for a dark ride.